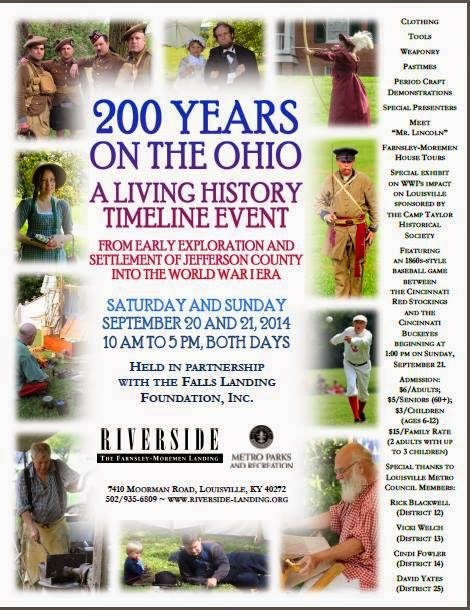 The Farnsley-Morman Landing is hosting a really neat event September 20th and 21st from 10am - 2 pm both days. They are doing a 'living history timeline', that starts in 1740 and spans through 1940. They will be showcasing historical re-enactments in a wide variety of categories that include: clothing, pastimes, food ways, tools and weapons. On Sunday September 21st, at 1pm there is a baseball game set in the 1860s between the Cincinnati Buckeyes and the Cincinnati Buckeyes. The cost is really affordable and is $6 for adults, $5 for seniors, $3 for children 6-12 and free for children 5 and under. You can see all of the details here. The Farnsley- Morman Landing is located in Louisville in the Pleasure Ridge Park area. Let me know if you check it out!